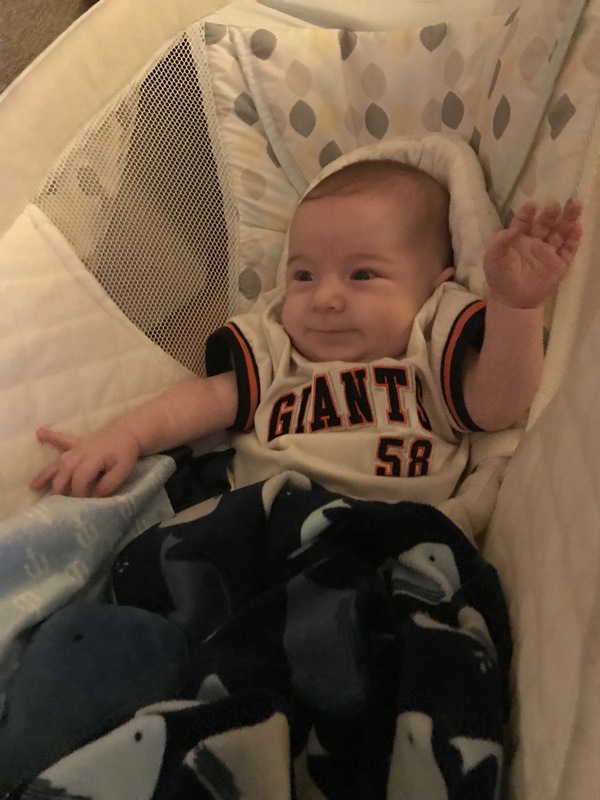 I started this blog in March 2017, my birth month and also the month I found out I was expecting. So much has changed since then both in our lives as a whole and in my blogging experience. I’ve had blogs for longer in duration, yet this is the most consistent blog I’ve had, and even though the other were related to the part-time wedding business I then owned, most likely has many more photos. 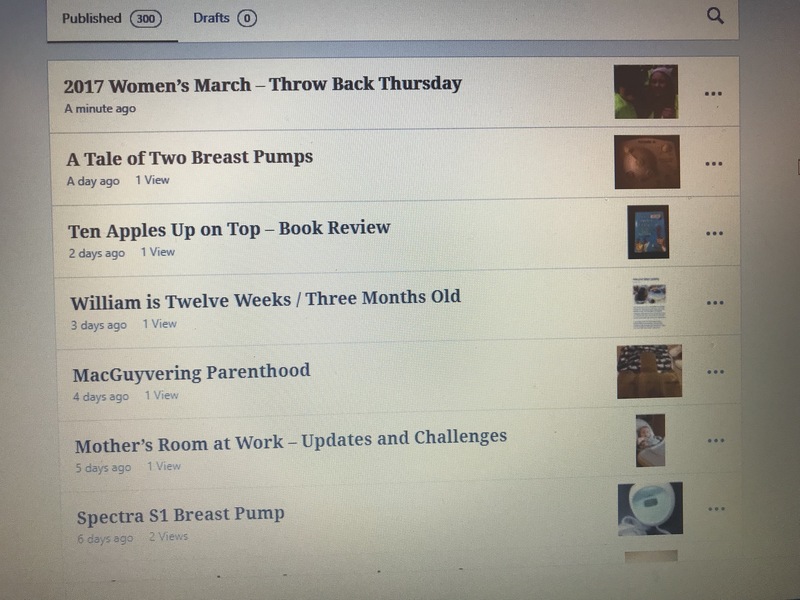 Looking at the last seven topics that helped me reach 300 posts, three of them are about breast pumping. When I first began my pregnancy journey and this blog, I knew breast pumping would be part of my life as I’d be returning to work after some time off, yet I didn’t know how complicated the process, and even the search for the right tools for the job would be. It certainly didn’t occur to me that I’d have others competing for the same Mother’s Room resources, perhaps as the last few companies I’d been at had been small enough that only one mother would be using such a room at a time. The company I’m at now has many more men then women, and I’ve been told this is the first time they’ve needed a room for one mother, let alone three. So I’ve had to answer questions about what the room is, why there isn’t a window to look in or out, and why everyone can’t reserve it. These questions have mainly been from men, yet ironically, the window question was asked by a woman with a child, though she admitted it had been many years since she had had to use a pump, so the logistics of why the window wasn’t there didn’t occur to her at first. One of the best parts of having this blog for me is having a chance to document so many moments, big and small in William’s life. I’ve been asked if either Matt or myself does the majority of any one particular parenthood duty. For the most part it’s been equal, though we have had to split up some duties. For feeding, I do all I can to either directly feed or pump lots of breast milk for him. When it comes time to give him a bottle with expressed milk of formula as needed, he’d rather not take one from me. I can give him one if he is very hungry, otherwise, he will fuss as he thinks I’m holding out on him breast milk wise, even though I only offer him a bottle when my own breasts are empty. 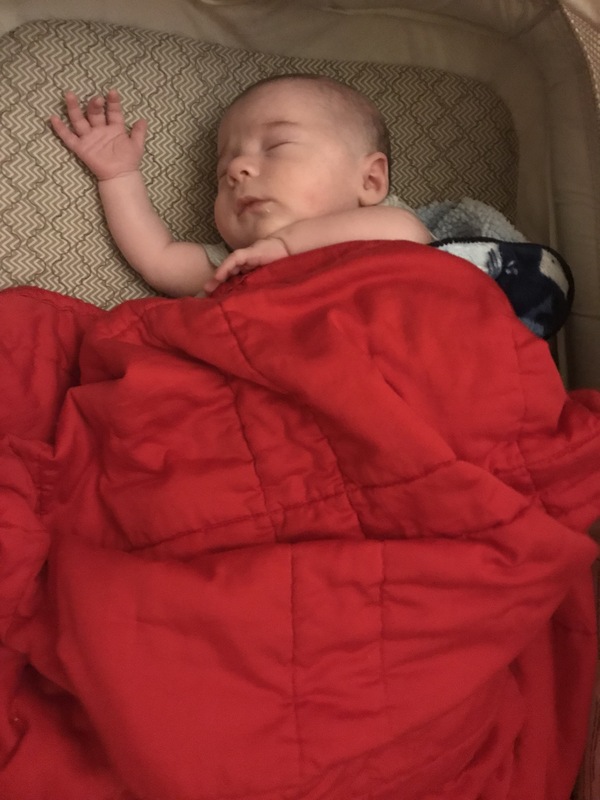 For putting him down for his nighttime sleep, Matt is the one who does the tightest swaddles and with some running waters as white noise, gets him to sleep the fastest for the longest amount of time. 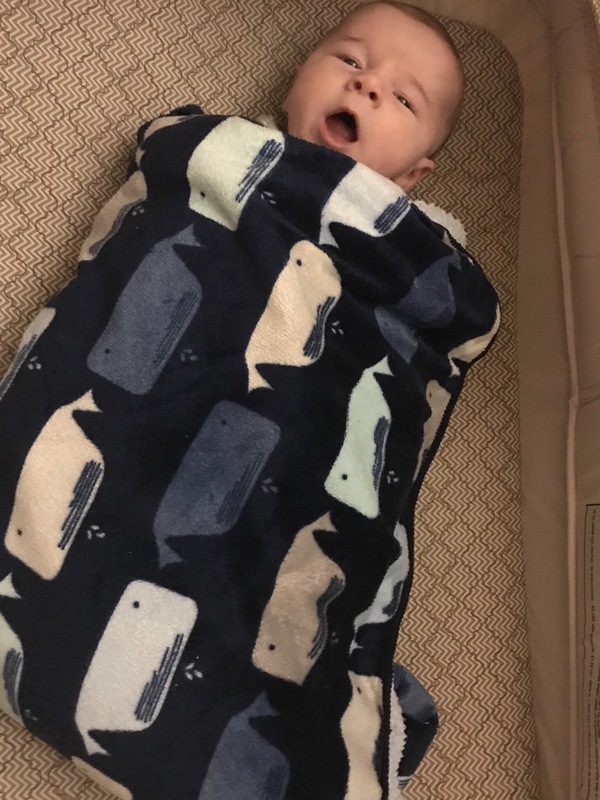 William is great at getting out of swaddles if they aren’t tight enough. If it’s not tight around him, he will easily free up one arm, and then the other. When he’s awake he loves moving his arms around. I know he was very happy in this photo, one that makes me so wish he could tell me what he is thinking. I have a blog entry for every day since I started it, so 100 blog entries ago would have been mid October. At that time I was preparing to have my child, meet him or her (as I was Team Green I didn’t yet know if I was carrying a William or a Natalie) and become a mom. Matt and I have gone from round the clock parents to working parents who trust Candy to watch him on Mondays and Tuesdays at our home, and Wednesdays through Fridays at an in home day care with Maribel. Candy has remarked numerous times how lucky we’ve been that he’s amenable to being held by so many people, and I agree, here he’s signalling that he’s ready and eager for Maribel to pick him up. I’ve been so amazed by how expressive he is. When I took him to Whole Foods to pick up lunch for Matt and I, he was sleeping after having had a fussy day. 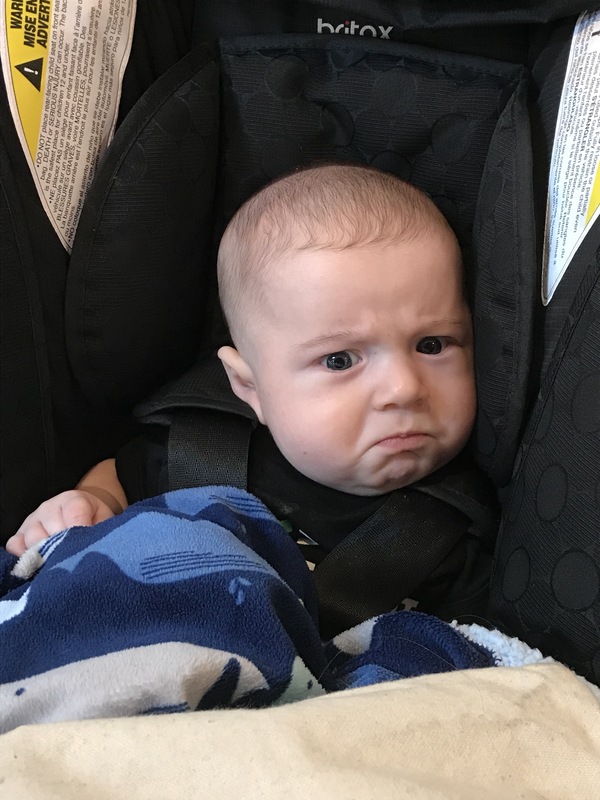 After a long wait at the deli counter and just after having been told they were out of peperocinos for Matt’s sandwich, William suddenly woke up and made a grumpy face. He, of course, didn’t know they were out of something we wanted, but his expression just cracks me up. I’m sure he really was grumpy at this point. We’ve learned so much about sleep, both his and ours, and what a valuable commodity it is. William does not sleep through the night, though he does pretty well. 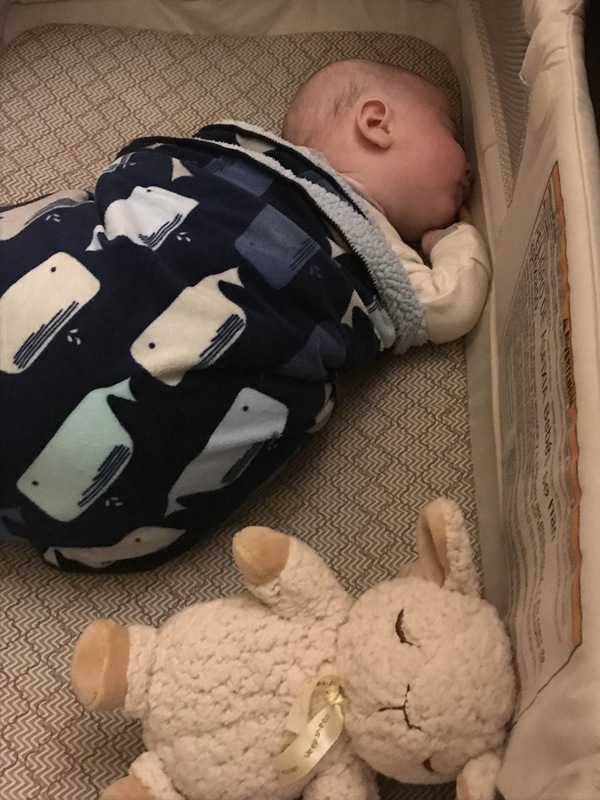 We put him down at 9 to 9:30 p.m. and he will stay asleep for a while, then want to breastfeed at around midnight, three a.m. and sometimes around five thirty or so. I’m convinced this is in part as knows there are many days when I am gone for a while and he’d prefer to feed from me directly then from any bottle. We definitely feel sleep deprived and have learned just how valuable a nap can be for us both, though it’s rare we can all three nap at the same time. The three of us have also learned why it’s important to introduce a toy at the right time for William. The mamaRoo is a famous toy that has the endorsement of 300 hospitals and several NICUs. With such a strong such number of endorsers, I was sure William would love it instantly. I was wrong, he cried so hard the many times I tried it in the beginning. Amber encouraged me to not give up, and so I kept it and, she was right as he got older he enjoys it more, even when he’s strapped in (as we do for his safety). He’s clearly fascinated with the mobile and though I don’t have a photo of it due to the timing of when it happened, I know he has moved the mobile on his own by hitting at it. Though I’d love to claim I blog each and every day, that is not the case. I especially have fallen behind during these last 100 entries (yet many days I’ll put pictures in to be saved for an entry I know I will blog later). 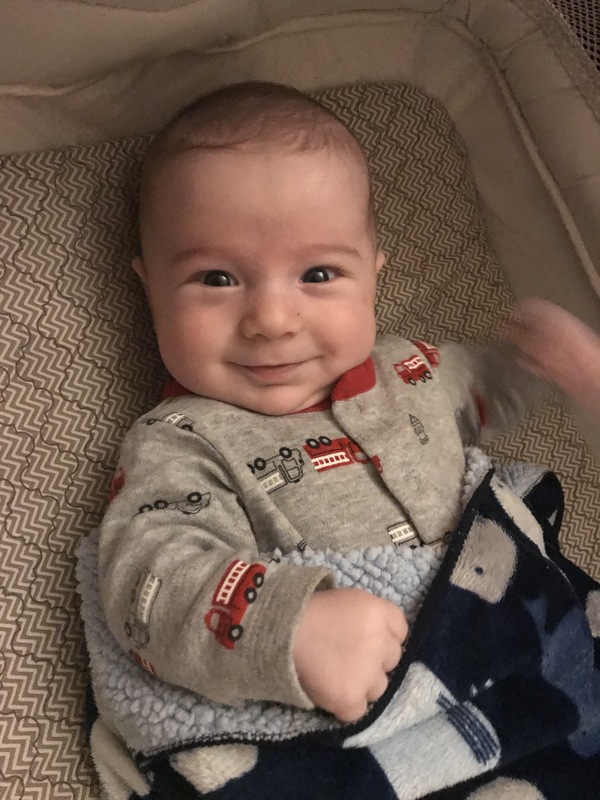 When I reached 200 entries I was sure I wouldn’t try to have an entry for every day, yet even when falling behind, sometimes way behind and having to write catch up entries, I’m enjoying having his our lives so well documented. Today was his baptism, which I’ll be blogging about perhaps this week depending on when I get some the photos taken back. It’s less important to me then it was in the beginning to get things blogged on or very near the day they happened, I’m just enjoying being the biographer of our family.